George John Pinwell is now described as belonging to a group of illustrators known as the Idyllists. 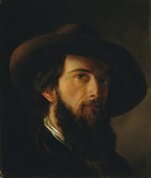 With little formal training, he made his way towards renown as one of the preeminent illustrators of the 1860s and 1870s. However, he also yearned to develop a career independently of magazine and book publishers. 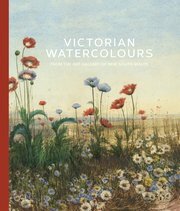 To this end he exhibited watercolours at the Dudley Gallery in Piccadilly, and sought election to the Society of Painters in Water Colours, becoming an associate in 1869 and a full member the following year. His origins as a designer of black-and-white wood engravings, which he drew in meticulous detail and often directly on the woodblock using small brushes, are evident in the Art Gallery of NSW’s superb work A seat in St James’s Park 1869. The delicate stippling in bodycolour, combined with touches of watercolour over opaque paint, capture the shimmering, frosty atmosphere perfectly. The genesis of this quintessentially Victorian scene was in the form of a wood engraving that Pinwell designed for the popular literary journal Once a Week in 1869. The illustration was published on 26 June, and its success immediately inspired the artist to rework the image into a highly finished watercolour. Considered one of Pinwell’s finest works, A seat in St James’s Park was bought by Edward Dalziel of the renowned engraving firm before being purchased at his sale in 1886 for the Art Gallery of New South Wales. Pinwell developed the watercolour through at least five compositional studies in pencil, black chalk and watercolour. Upon its completion, the composition also inspired a second wood engraving. Only several proof impressions are known, one of which is in the Gallery’s collection. Pinwell died of tuberculosis at the age of 33 in 1875.